It’s fairly difficult to talk about Sherlock Holmes Consulting Detective at any great length and avoid spoilers. (I will be avoiding them, before you throw yourself on your screen in a valiant effort to protect anyone else in the room from spoilers. It’s safe to read on.) The game trades in mysteries, and to unravel any of them would be to do a great disservice to anyone why has yet to play the game. For that reason, all the situations and characters to which the following post alludes to are fictional. Obviously, so are all the cases and characters in Sherlock Holmes, so I guess these are fictional-fictional characters to protect the identities of fictional characters. Still with me? Good, let’s begin: It’s all about the motive. That’s what I think elevates Consulting Detective from a good to a great game, and it’s why I love the game so much; why I find it to be so immersive, exciting, and memorable. The game presents you with ten unique cases, ranging from murder to burglary, but mostly murder. This is Victorian London, after all, and as anyone who knows their history will tell you, Jack the Ripper was prime minister at the time, and Sweeney Todd was the city’s greatest tourist attraction, beheading anything from 5-10 foreign tourists a week in his waxwork museum of foggy horrors. Consulting Detective presents players with a map of London, a directory of businesses, places, people and allies, and a newspaper for the day in question, packed with articles and advertisements, which will contain a mix of clues, colour from the period, and red herrings. Each case has its own casebook. It will begin with a meeting with Sherlock regarding the case in question, and after that, everything is up to you. The game doesn’t hold your hand, or ask you to follow a particular sequence, or indeed jump through hoops of any kind. After you’ve read the passage in the case book where you hear the details of the crime, you’re on your own. Want to visit the location of the murder? Look it up on the map and off you go. Prefer to start at the coroner’s and see how the victim met their end? Turn to that entry and begin there, instead. The directory of places and people in London numbers in the hundreds, but only a fraction will be relevant to each case. If you discover there was poison involved, a visit to a chemist might be in order for more information. But with 6 chemists listed, where do you begin? The answer, as we discovered, was to pore over the map and see which listed chemist was closest to the location of where our suspect lived. This is the level of involvement that Consulting Detective elicits. When playing, our gaming table will be covered in notes, lists, paper trails, even hand-drawn diagrams of murder scenes, pieced together in order to better understand the events we’re investigating. If all this sounds like a chore, though, then I’m giving the wrong impression. It’s nothing short of a labour of love, each scrap of paper and hand-drawn doodle bringing you further into a fascinating world of murder and intrigue. But of course, all of your gathered information won’t hold together without a motive. And as I said at the top, this is where the game really shines. After you’ve traipsed the full length of the map, even if you’ve spoken to every character in the book (and we often have), this in itself is not enough. 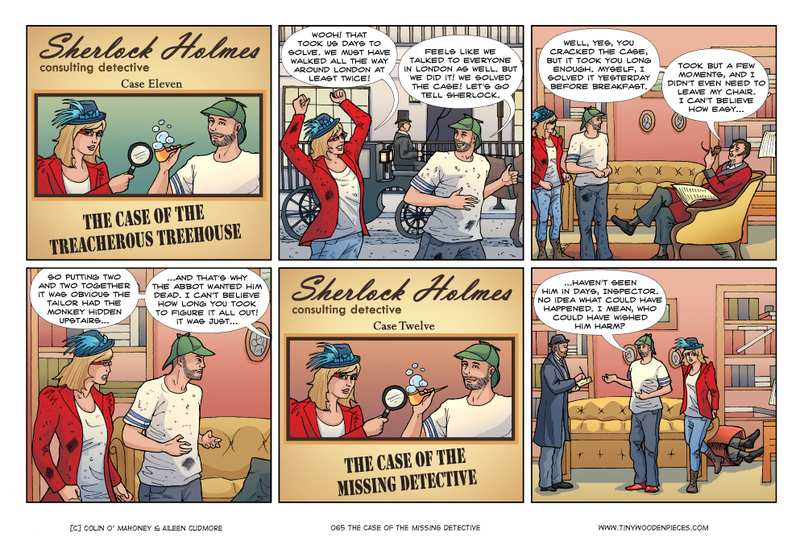 At the denouement of each case, you return to Sherlock, who quizzes you on your findings. This is where you pass or fail, and as you turn to that page in the case book, you will be on tenterhooks. Because even you know for a fact Sir Alan Dudley was at the scene of the crime, and you’ve discovered he purchased a revolver two day prior to the murder, this will only be part of what Sherlock will ask you. Who the culprit was, in fact, will be simply the first question. After that comes the why? And this won’t be in the material. You can have visited a gun store and got a description matching your suspect, but nobody will be outright able to tell you why. It’s there, of course. It’s just hidden between the lines. You might link frequent visits to a nearby hotel to an affair, which might be the root of the murder. An altercation you read about in a paper from 2 cases ago might have mentioned the victim, and did you read somewhere else that the other person involved was heavily in debt? Could all of this be linked? You might spend literally hours discussing all of this, but only when you turn the page to read the answers will you know for sure if what you suspect is true. If the lines you drew from fact to seemingly unconnected fact form an incoherent mess of scribbles, or a clear picture of a crime, complete with suspect and motive. I picked up a copy of SH:CD after the Shut Up and Sit Down guys recommended it so highly. We played our first game at the last game night and it was Epic. Yes, capital E. We pored over the case for 2.5-3 hours and it felt like about 20 minutes. And we got 6/8 questions correct, which was awesome! Oh, and then we got slapped about by Sherlock who had managed to solve the crime by following only 4 leads compared to our 17. He is an enormous a**hole, isn’t he. It really is that good, isn’t it? It was Shut Up and Sit Down that led us to the game as well. We are up to case four, and the only issue we have had (other than occasional harmless typos) is Case Three. You will find that really annoying, as they apparently made some changes in the reprint, and it does show. If you play Case Three, look it up after you have completed it, we found some answers on BGG that were more satisfying, and made us feel better about it. But that Case Three it’s all good again. We Loved Case Four. That sounds like a really neat game. But after you’ve played through all ten, are you just…done? Can you never play it again? Yes, but you just played a great engrossing game 10 times. 3-4 hours a shot, that is money well spent. The key is to enjoy each case to the full. That’s a good point. Thinking for comparison, Arkham Horror also takes around 4 hours to play, we’ve had it for about 3 years, and I don’t think we’ve played it 10 times. I am a huge Arkham Horror fan. 🙂 Even with the long playtime, I have recorded 24 games of it on BGG and I have a couple other plays of it before I started recording on BGG. I took a 3 year break from it though just because of the long play time. But, getting back into it again now (and having just as much fun). Consulting Detective is a great game. I have played the first 2 cases with a friend. We are getting better, but still, our score of -120 on the first case was quite humorous. We did better on case 2 with only a -5. 🙂 Yes, both of those are negative numbers…we followed A LOT of leads in the first case…37 to be precise.